This week Access All Areas members have a thorough collection of handy sunburst shapes and complementing vector graphics to download, courtesy of Tatiana Lapina from Creative Veila. Sunbursts are really popular graphics that designers love to use in their vintage logos and to highlight titles or promotional text. 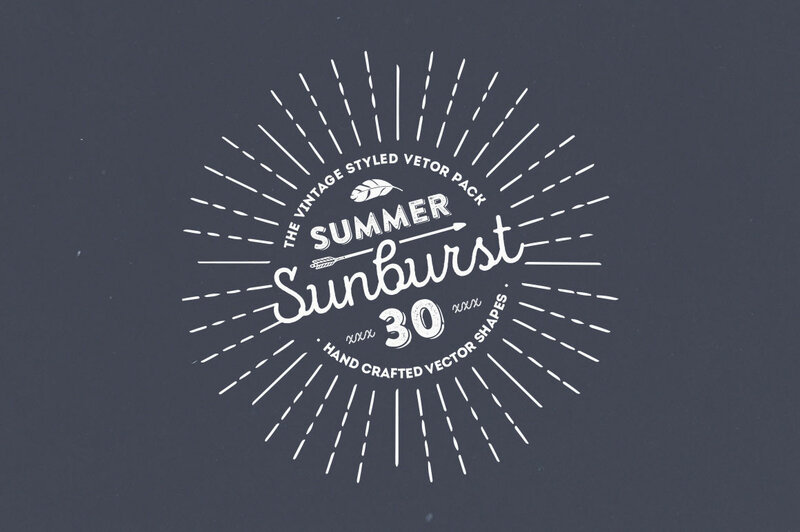 The pack contains a huge variety with 30 different sunburst styles, along with a bonus set of vector extras that includes badge backgrounds and outdoors themed illustrations. Tatiana Lapina is a freelance graphic designer and enthusiastic photographer with a passion for creating unique things. She offers interesting and unique resources in her Creative Market store, including lots of brilliantly illustrated vector graphics, mockup templates and scene creators. This sunburst vector graphics pack for Access All Areas members gives you a head start when building your logos and promotional graphics. Choose from a range of burst styles, from basic lines to detailed combinations of decorative shapes. To complement your designs, a bonus set of additional badge shapes and illustrations is included to provide you with a series of ready-made assets to pick and choose from in order to quickly put together your designs. This is a nice assortment! Thanks to Tatiana and to Chris for bringing them to us! The easiest way is to draw a selection around the one you want to use with the Direct Selection tool to grab just those shapes. Alternatively if you right click and select Isolate Selected Group, you can grab each one individually.